Ouch. Rudy Giuliani says Hillary Clinton could be Considered a “Founding Member” of ISIS! Former Intelligence Chief – Obama Doesn’t Think Terrorism is a Big Deal! How Outraged will Liberals Get? 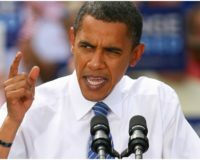 Obama Supporter Louis Farrakhan calls Rudy Giuliani a “Privileged Cracker” and “Devil” for Speaking Out against Obama!